A jury has convicted 22-year old Anonymous hacktivist Christopher Weatherhead for playing a lead role in organizing a series of distributed denial of service attacks against PayPal (and others) in 2010. Weatherhead's cohorts, Peter Gibson, Jake Bichall and Ashley Rhodes, were also accused of and plead guilty to participating in "Operation: Payback" -- a 10-day DDoS attack which crippled PayPal (and others) for several hours. PayPal claims the stunt cost it a whopping £3.5 million, or about $5.6 million, in damages. The jury found Weatherhead guilty of "conspiracy to impair the operation of computers", in accordance to the Criminal Law Act of 1977. The judge warned Weatherhead (and his associates) that they could be facing jail time; however, a sentence won't be issued until a later date. "I want to have as much information as possible before deciding what should happen in the case of these four men," the judge said. "I think these are serious offences to my mind, and I hope the defendant understands that." In the meantime, Weatherhead -- or Nerdo, as he's known on the web -- was told by the court he may use a computer but can only use his real name online (i.e. no pseudonyms) and must abide by a midnight to 4:00am curfew. He'll also be electronically tagged. During the trial, Weatherhead framed himself as an idealist who was upset with state of censorship on the web. 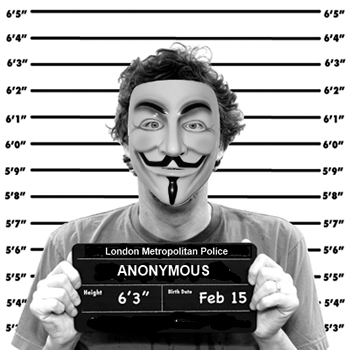 Anonymous' anti-censorship message resonated with him, luring him into the hacktivist group. In 2010, Anonymous set its sights on PayPal after the company ceased processing donations for Wikileaks, a controversial whistle-blowing organization. The electronic payment service also automatically froze Wikileak's assets amidst a particularly tumultuous time for the secret-publishing outfit.